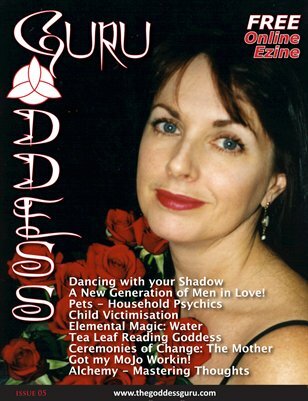 An International Spiritual Women's Magazine. In this issue our illustrious editor S'Roya is featured on the cover; We're showcasing some new Guru's for you all to check out, with loads of exciting articles for your reading pleasure. S"Roya looks at the darker side of our nature with 'Dancing with your Shadow'; She DeMontford wows us with her article 'Child Victimisation', a political piece for those activists out there seeking to change what appears to be closed minds; Jane Meredith features another of her series of 'Elemental Magic: Water', A well known Psychic, Lindel Barker-Revell shares 'Tea Leaf Reading Goddess'; and Mikailah Gooda writes another in her series of 'Ceremonies of Change: The Mother;' our resident HooDoo goddess Amber Rose, writes an interesting piece 'Got my MoJo Workin! ; while our resident Wisard & Alchemist, Michael Lamb puts a new twist on 'Alchemy - Mastering Thoughts'... Enjoy!